To work out whether your setup will hold your planned load, Systéal has developed an online simulation tool. Please note: this simulator is offered with no guarantees from Systéal. Your structure must be checked by a specialist design office in case of doubt. To use it, go to the page for the product in which you are interested, then click on the "Bending load calculator". You can then confirm your simulation by clicking on "Calculate"
The maximum load is the weight which the load on your frame cannot pass. If the results are red: the deflection is too high. Reduce the load or change the structure. If the results are green: your structure is fine and will hold the load. What is the difference between the x axis and the y axis? 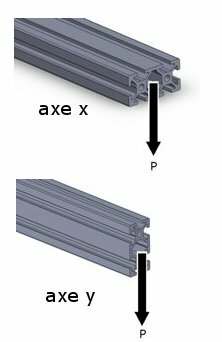 The maximum load and deflection (arrow) will differ depending on the orientation of the profile.